Publications across America, this one included, had a grand old time coming up with silly headlines to put above stories about Mets ace Matt Harvey’s bladder infection and blood clots, which briefly threatened to cost Harvey his Opening Day start. Harvey saw all of our jokes, and he’s not too happy about them. 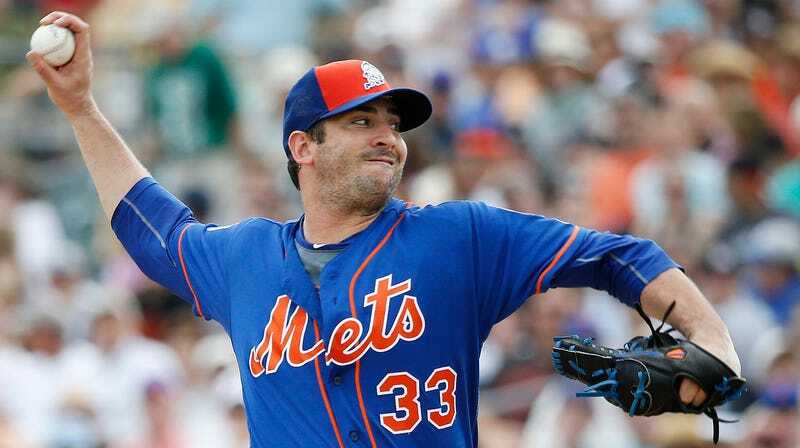 Apparently annoyed that his health scare was mocked and turned into bathroom humor on the back pages and in the headlines back in New York, Mets Opening Day starter Matt Harvey declined to speak to the media after pitching on Wednesday. “I don’t blame him,” Terry Collins told the Daily News Wednesday. “Nobody in here blames him. We were scared Monday. You know how scary it is when they are talking about having to decide in 24 hours what kind of procedure they would have to do to remove the clot if it didn’t pass? They were talking about the fact he wouldn’t be able to fly to New York. On the one hand, it’s totally understandable for Harvey to be upset; I don’t doubt that he was rattled by the diagnosis, and blood clots are a serious thing. However, nobody was having a laugh before it was clear that Harvey was fine, and most of the jokes were about Harvey’s admission that the infection may have been brought on by his tendency to hold his pee for too long. Anyone who looks reporters—New York reporters! New York tabloid reporters!—dead in the face and admits that his piss rig got all jacked up because he didn’t whiz enough is in for some light ribbing.